The S13, S14, FD3S, and the AE86 still continue to be the foremost appealing vehicles in drifting although there are newer more powerful vehicles available in the market. This leads to doubts about those new vehicles, if they actually hold a potential for drifting. Let's inspect to see if these vehicles can be enjoyed drifting! This is the comprehensive tuning guide! Not a problem sliding this thing! The Z33 is a FR configured vehicle with a fairly large naturally aspirated 3.5liter motor. This vehicle may seem like the best modern platform that's available for drifting but on the contrary, the Z33s that compete in the D1 series have been having lots of setting issues. This brings out the question of the Z33's real potential. 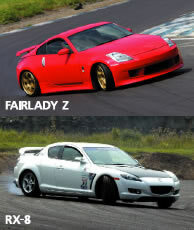 Yashio Factory's Oka-chan saids,"The Z33 is a great drift machine for the novice to intermediate levels. The nose dives right in the turns and the controllability of the slide is exceptional. The weight transfer is a bit on the sluggish side but way sufficient just for the enjoyment of drifting". Oka-chan brought out his Z33 outfitted with Yashio Factory original components such as the suspension and LSD and showed us what this car was capable of on the race track Since the Z33 is a FR vehicle, it's fairly easy to drive and doesn't require any heavy tuning. There are a couple of things that must be done though. First, the cooling system must be dealt with to prevent water and oil problems. And second, to eliminate the G sensor if the vehicle is equipped with a VDC. The recommended initial tuning approach is to change the exhaust system to increase the torque band starting from 3000 rpm. Altering the final gear to 3.9 is very effective when the gear ratio doesn't match the track conditions. Another problem the Z33 is the lack of space to carry a spare tire because of its huge strut tower bar in the rear. It's possible to stuff 4 wheels back there, but might be a nuisance to drive around with that. The only solution is to bring another vehicle to the track to store the wheels in. Slamming the car with a body kit and rims enhances the Z dramatically. Yashio Factory's Z33 sports an aero kit made by T&E. The suspension and other components based on HKS products are currently being developed. The springs are set at F 14kg/mm and R 10kg/mm to bring out the best feeing of the car. The R&D is still being finalized. Oka-chan claims "By just tuning the ECU, the torque is increased from 3000 rpms and up". A Nismo 1.5 way was also installed. Turning off the VDC switch doesn't fully eliminate the function. The only way is to do this without eliminating the ABS is to unplug the G sensor or just to pull the ABS fuse all together. The Z33 tends to run oil and water temps very hot. 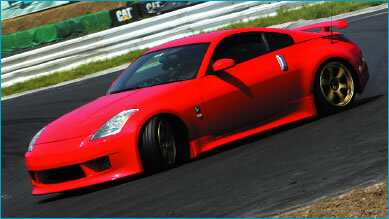 A larger radiator and oil cooler are a must to enjoy the Z33 at a circuit. It's very difficult to enjoy the day at the race tracks with spare tires stuffed in the rear. A 4 door V35 might have more space in regards to this problem than the Z33. A S2000 can't drift?! I don't think so! The S2000 is perceived as a non-drift car. 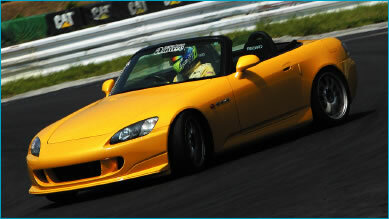 The earlier S2000 models' tendency to oversteer becomes more apparent as the velocity increases. This vehicle is totally capable of drifting it just hasn't been recognized for it. The suspension kits available on the market for the S2000 increased the car's performance to a very high level however, these products made it more difficult to hold the car at a sideways slide. 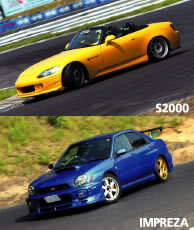 This fact contributed to the negative image of S2000 as a drift car. In order to drift this vehicle, the peak vehicle controls need to be upgraded. On some occasions, just changing the tires might be a solution, but to be able to control that is the key. The general idea is to have a suspension setup that performs well in any applied situation. "This new suspension kit increases the rear end control of the S2000 without changing the roll center. This kit was created for time attack (grip racing) but one day, we attempted to drift the car. Surprisingly, the car was very stable" claims Mr. Tanabe from Amuse. Since the driver sits directly above the rear tires on the S2000, it gives a false impression to the driver during drifting, that the car is at a bigger angle than it seems. So the driver ends up over countersteering. The S2000 can be used for both grip and drift if t he vehicle is setup correctly. This car may be perfect for a person who wants to do both. RE-01R tires are used. 215/45-17 and 245/40-17 were installed, the same size as the stock tires on the later model S2000. This car holds a record of 1.05 at Tsukuba with the same suspension setup. High tech damper kit with a separate tank is installed on the rear. Amuse constructed this product after many hours of R&D to increase the peak potential of the car. This model is popular due to many positive reviews. A Cusco LSD was used on this vehicle. This is one of the most important components when it comes to drift or grip. The computer retards the timing when the intake air temperature increases. Because of this, the midrange torque is reduced. Fresh cold intake air is an extremely vital modification. At a smaller track, a lower final gear may be more useful. An effective way of increasing the performance is to stay within the high powerband of this N/A engine. Mr. Tanabe claims "this vehicle was tuned to broaden the performance for time attacks, but managed to be a pretty good setup for drifting"
Suspension and tires to supplement the lack of power! The FD3S RX-7 may carry a drifting image but its successor the RX-8, doesn't as much. It's believed that the naturally aspirated rotary engine has a low power and torque out put so it is not suited for drifting. What the people don't realize is that this car has great handling and a rigid chassis. "This car is totally balanced" claims Aoki at Revolution. This RX-8 has been outfitted with custom parts from Revolution aimed at increasing the car's performance. The owner of this vehicle knows the weak points of the RX-8 very well such as the cooling issues. He claims a high capacity radiator and an oil cooler should be installed right away. "The car should be ready to drift after installing an aftermarket LSD and a suspension kit. The stock suspension creates too much body roll and may be difficult to drift with" he claims. 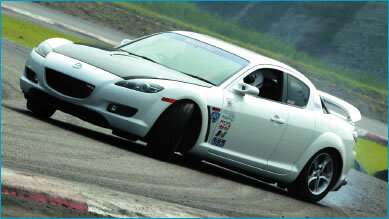 Tire selection is a very important factor in drifting with the RX-8. This car comes stock 16" or 18" rims. Anything over 17" in the rear causes camber issues, causing difficulty to drift. The RX-8 has plenty of space to store tires or tools in the rear making this car a great car to take to the track. The RX-8 is a good drift machine once the minimum criteria are taken care of. This car was fitted with lots of original parts from Revolution. The owner enjoys gripping and drifting without having to change the basic settings. The spring ratio for Revolution's suspension is 10kg/mm for the front and 6kg/mm for the rear. This vehicle has AP Racing's Front Brake Caliper installed for Gripping. Since the e brake is shaped irregularly, it may take some getting used to. Changing the rear tires to a low grip set will make drifting easier. An RX-8 stock 16 inch rim is pictured. The home made water spray on the HKS oil cooler and the radiator was made to fight the heat. This allows for the vehicle to be driven hard even in the summer. The suicide door function makes it easier to store tires and tools in the rear. 4 18" tire and rim fit perfectly in the large capacity space. Big modifications aren't necessary. Just install a center differential! Subaru's popularity as a drift machine increased soon after Kumakubo's Impreza was introduced in D1 racing. This makes sense because the Impreza is equipped with a strong engine, has plenty of power, and lots of aftermarket parts are available for it. This car has always been respected in the motorsport world and besides the fact that it is 4WD; it may be the perfect machine for drifting. Kumakubo's Impreza received extensive modifications to the drivetrain to convert its configuration, but there is an alternative. Watanabe Service has a component called the Drift Center Differential on the market To convert it to FR, this differential is swapped in, and no modification to the front driveshaft is necessary. The 4WD configuration can be put back as well. The only down side may be that the steering angle conflicts with the 4WD front driveshaft. If this car was able to produce a bit more drift angle, then it would be the ideal car. The car is driftable though, but to a professional drifter, it may lack some angle. To the rest of us, this setup may perform just as well as a S13. The exterior may not be much to look at, but this car moves like a drift machine! The rear tires were swapped in with a wider set to get more traction. The STI version of the GDB Impreza is already equipped with Brembo brakes. Plenty of aftermarket parts are available for this car. These are the center differential. The right one is for the GC8( A-E type) and BG type Legacy. The middle one is for the GC8 (F, G type) and BH type Legacy, and for the 5 speed GDB. These 2 products are priced at 48,000yen. The left one is for 6-speed GDB at the price of 68,000yen. It's only applicable on vehicles without DCCD. 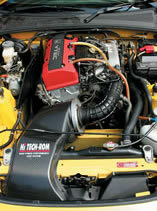 The STI version's stock motor creates up to 280hp. 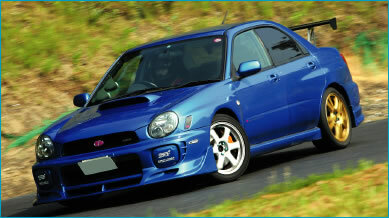 The models up to GC8 was known to be equipped with a weak transmission but were improved from the GDB model. The small differential capacity and the thin drive shaft should not be anything to stress about. Watanabe Service has been working on the same product for the Lancer Evolution. This product only fits the 4 th Lancer not equipped with ACD. The FR conversion is the same theory as the Impreza product.